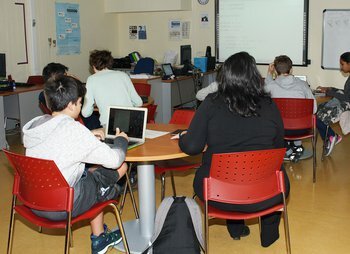 The Math / Science Studio, located at the 3rd floor of the Sabbagh Library, offers Middle school and Academy students personalized assistance in Mathematics, Physics, Biology, Chemistry, and Environmental Systems and Societies according to their individual needs. Students work individually or in groups at their own pace guided by the Math/ Science Studio team of teachers. 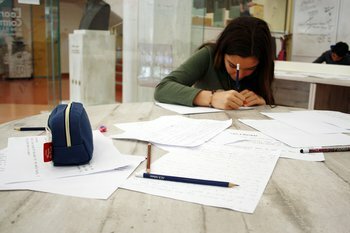 As it is often challenging for students to realize the beauty of mathematics, to see the whole picture of this exciting discipline and how it is connected with almost every other discipline and life in general, our main goal is to make students love mathematics and guide them to learn how to think in a mathematical way. Through that perspective we insist on the conceptual understanding of the material taught. Additionally, students are given mathematical riddles and puzzles to work on in order to cultivate mathematical reasoning, interesting problems to enhance their skills as well as extracurricular activities to engage them in learning. We often conduct interdisciplinary workshops to showcase the interrelation of mathematics with other sciences, music, and art and at the same time inspire students as well as broaden their horizons. Located on the 2nd floor of the H.J. Sabbagh Library, the Database Research and Literacy Studio supports and promotes reading and research activities in our community. The staff is available to assist Middle School and Academy students in finding the reading resources they need to develop a love of reading and to research the topics they would like to learn more about. From one-on-one sessions to seminars and workshops, the Database Research and Literacy Studio helps Middle School and Academy students find valid and relevant information for independent projects, curriculum research papers and extended essays. Students are also able to find reading level appropriate fiction and non-fiction articles and books for their pleasure and their learning. 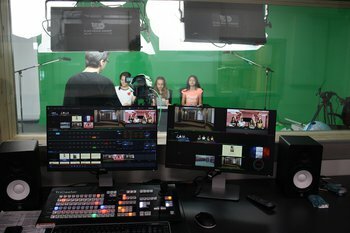 If you are wondering what a media studio is then… don’t miss the chance to stop by the 2nd floor of the Sabbagh Library every day 10 am to 2 pm and by appointment. Mr. Thanasis Palos is always willing to introduce you to the AV methodology such as Film, TV and New Media Pre-Production, Production, Post-Production, and to initiate you to the AV language, with a twelve level experience method (screenwriting, photostory and animation, short film, video CV, documentary production, documentary trailer production, film analysis, film trailers, television production, video campaign, the audiovisual language in the classroom, accessibility in Theater, Cinema and TV.